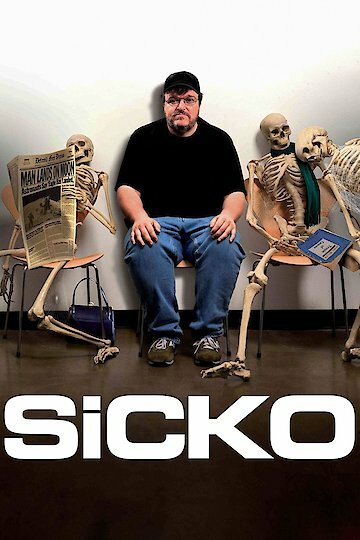 In Sicko, Government and Corporate corruption aficionado, Michael Moore, takes the American For Profit Health Care Industry to task, in this glaring Expose styled Documentary. The social critic, activist and superstar film maker shines glaring focus on the fraud, profiteering, and politicizing of life and death, that continuously keeps 50 million or more Americans a year from receiving adequate health care, while rewarding company doctors more for saving profit margins than for giving superior medical treatment. In 1961, a future president speaks ominously of the creeping spread of liberty stealing socialism that Universal Healthcare brings, in a record pressed and released by the American Medical Association. While in the 1973, Give them less Care and they will pay more for it, was the private elicitation that got a nod from the then US president Richard Nixon, leading to the Health Maintenance Organization HMO Act of 1973. With deft skill and the surgical precision, Sicko deconstructs the progression of an ever more money driven and power hungry device known as PhRMA, the Pharmaceutical Research and Manufacturers of America, the lobbying group of the worlds biggest pharmacological companies, and its deep reach into the very seats of Congress. First silencing one Presidents appointee to the Reform of the American Health Care System, then buying that same appointee a seat in congress as a New York Senator. Travel to Universal Health Care countries such as The United Kingdom, France, Canada, and Cuba, Micheal Moore illuminates the ways in which other nations have made sure each and every citizen has such basic needs as doctors, nurses, medicine, and care. While using such examples as Police and Fire services, Public Education, Libraries, and the United Postal Service, Sicko debunks, the notion that Universal Health Care will lead to an ultimately Socialist America. Using archived footage, live interviews, and the brash, in your face, journalism that he has become famous for, Michael Moore continues to raise the issues that plague The People, in the time honored fashion of on the road activism, with devilish flare and gritty hard-line pragmatism; presented in a way that that is startling, engaging, and easy to enjoy. Sicko is currently available to watch and stream, buy on demand at Amazon, iTunes, YouTube VOD online.